As the leading provider for secure access solutions, Chipdrive now offers a new software solution. The new Chipdrive Smartcard Commander allows users to edit or display data on various smart card types. 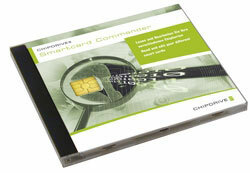 The Chipdrive Smartcard Commander is the successor to the well known Chipdrive Smartcard Tools suite. Its major advantages the software modules Smartcard Editor, SIM Manager Pro, Banque card Manager as well as KVK Viewer and SV Viewer for health cards are integrated into the main interface and not sold separately anymore. Convenient display screens help to read and, if allowed, edit data of health, signature, bank, HBCI or GSM cards, and even electronic passports. By installing additional software modules, the Chipdrive Smartcard Commander can be upgraded effortlessly. Accordingly, the Commander can support new smart card types or support new editing features for existing card types. The full version on CD-ROM is included with the Smartcard Commander.